Well my favourite photo storage solution just got better! Picasa Web Albums just increased its free storage offering to 1Gb (and there was I starting to think that it would be good to subscribe to get more storage space). 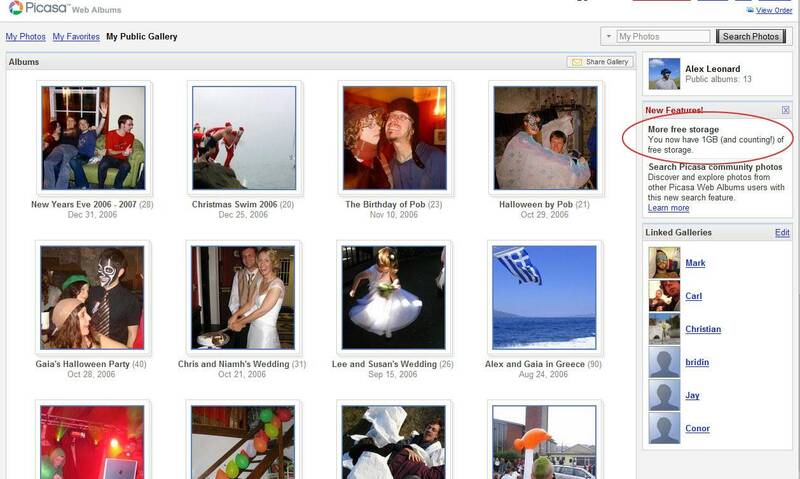 To the people at Vox: I would love if you included Picasa WA in the photo accounts along with Flickr and Photobucket. I’m not sure if there would be as big a user base, but I’m sure there must be people out there who use it. Any other Picasa users care to comment? For those of you not familiar with it, Picasa is a free photo organiser that Google bought a year or two ago. It’s by far and away the best organiser I’ve used, with excellent speed, search, and very useful quick editing tools. When they integrated their web albums I was delighted, it meant that I could easily sort out sharing some of my many many photos with people, and it is so easy to quickly create albums (tagged, grouped, and captioned) in Picasa and then just upload the whole lot.